Returning home from this year’s Race for the Cure I began thinking how since I was diagnosed Breast Cancer in late 2005, my life has been an emotional rollercoaster ride of anger, frustration and ultimately hope – confirming my faith in God and in the wonderful community of people who have wanted the very best for me along the way. I had done everything right back then including a routine breast self exam the year prior when I felt a suspicious mass in my right breast. I immediately consulted my physician who told me it wasn’t anything to be concerned about and that at 35 years old, a mammogram wasn’t necessary. Okay, I thought, she’s the professional and I trust her. It wasn’t until I changed my health insurance, and my doctor, that I went back for another exam. A breast ultrasound was ordered, and my mass, now measuring 4 centimeters wide turned out to be a tumor and I was given the news that I had Stage 4 with lympnode involvement. I remember thinking about my relationship with God, which was strong and meaningful to me. I did have a moment when I thought, “How could this happen to me?” Then God covered me and assured me everything would be alright, even with the trials and tribulation I was about to endure, he would see me through it. Peace would come in the middle of my storm. And then wonderful things started to unfold. 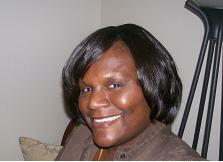 My surgeon Tomi Evans possessed a kind spirit that made me feel secure. She had all these angels in her office and when we met to discuss the course of treatment. I knew that I would be well looked after. Shortly after, I became aware that this disease affects women who are in close proximity to you, with out knowing who they are. I was explaining to a co-worker the process I was going to go through to shrink the tumor before it could be removed. One of my co-workers who I would say hello in passing asked who my oncologist was because she was also going through breast cancer treatment. It turned out we were seeing the same oncologist group. I was elated to connect with someone who knew exactly what I was going through! We started scheduling our chemo appointments together. Thankfully I had a friend who I could laugh and cry with. Now the chemotherapy seemed conquerable. However, I can recall one of the chemo infused drugs that I had to conquer a little harder. My chemo treatment drug was changing and the nurse told me while setting up the drip that a pharmaceutical rep had given the drug the nickname, “Red Devil”. I was appalled at the name and immediately said to the nurse, “Who wants the devil infused in them? !” As a result they changed the name of the drug to “Red Angel” for me and my co-worker! Some battles are worth fighting for. We all know breast cancer knows no boundaries and doesn’t discriminate. Apparently it doesn’t recognize holidays either because I had my surgery the week of Christmas. 2005. The surgery took 13 hours and when I awoke on Christmas Day I felt as if I’d been hit by a Santa’s Sled! I seriously wondered if I’d be laying down for the rest of my life because I felt an emptiness and pain I’d never experienced before. But that morning I also began to think about all that I had gone through and all the people that had prayed for me. I also had a wonderful husband and two beautiful, healthy boys I couldn’t wait to hold in my arms. And so I gave thanks for being alive and began to re-align with my spirituality. It was to be the only “me” time I would have for a while. My family arrived later that morning and I remember thinking this was the greatest Christmas gift I could have ever asked for. In the following months after my surgery I felt I had equipped myself to carry on and never look back. Because of my job at a health insurance company, I knew the right questions to ask. I knew I had to be my own advocate from now on. Stand up. Ask. Inquire. You are more capable than you think. I became prouder of me and realized it was okay to be my own Florence Nightingale. The days were long but they gave me a chance to realize how strong I’d become. Sometimes our pride and expectations of those around us keeps us from reality. Core morbidity had set in from the chemo. My wig was driving me crazy and I still didn’t have any eye brows. My mind was still not 100% cool with what had happened. In hind sight, I now know I should have gone to counseling right away. I was doing all the tough lady stuff but not focusing on how much this cancer had really affected me. Then I had a nervous breakdown. I wasn’t as strong as I first thought. I started counseling immediately and it worked! My life slowly began to take hold again and I began to identify with others who had had similar challenges thrust at them. I started helping women at work and began to volunteer with a non-profit group called “Breast Angels.” The interaction gave me a real purpose and the feeling I got from giving back made me feel like I was being placed on a pedestal. “Let me just have this for today” I remember thinking. When it came time for me to celebrate five years of being cancer free, I chose to form a Race for the Cure team this year. Eight women in my department alone have been diagnosed with cancer over the past 5 years and so it was the logical next step of my journey. Race Day was one of the most exhilarating and empowering days of my life. I was with women that I knew and admired but I also felt an immediate kinship with the thousands of survivors I didn’t know. I decided then that for me, every day would be Race Day and like an artist who signs her name to a painting, I would sign my name to each day. We all can do this. We don’t have to wait for what happened to me and millions like me to make this commitment. I am cancer free and happy with a family and community of friends and colleagues I love. I am proud of my canvas so far! I look forward to each day and will look forward to next year’s Race for the Cure. 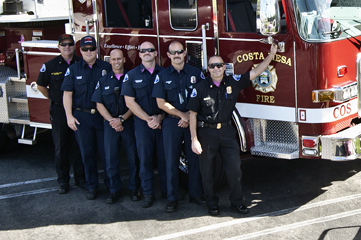 Many members of the Costa Mesa Fire Department wore pink while on duty in October. 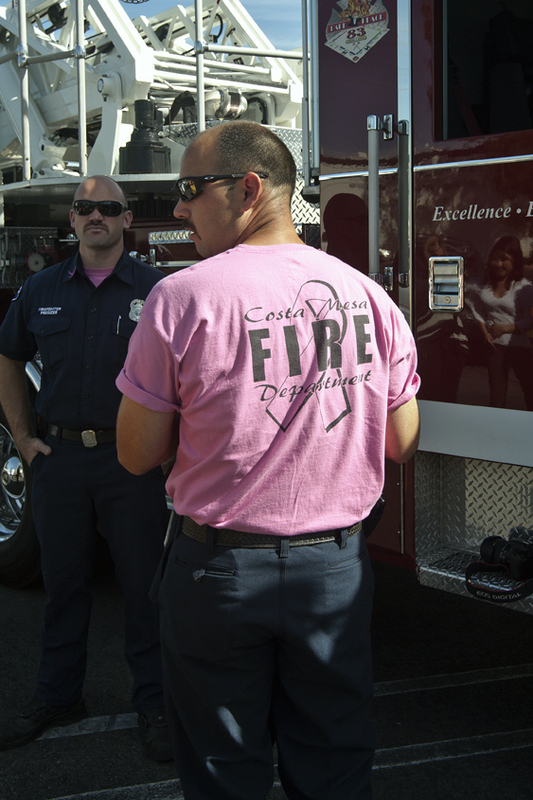 The firefighters gained permission to wear special pink T-shirts on duty to commemorate National Breast Cancer Awareness Month. The goal was to make a bold statement about breast cancer awareness. Thank you for your support CMFD! We think a strong statement is made when people see an iconic firefighter bathed in pink! YOU ARE THE CURE! On October 21, 2010, Howard Murad M.D., founder of Murad, Inc. hosted The Art of Giving: An Inclusive Charitable Event, which raised over $25,000 for local and national charities. At the event, community leaders, art aficionados and the local community previewed and purchased 30 works of art created and donated by Murad himself, with proceeds benefiting the charity of the buyer’s choice. Over 70 charities were beneficiaries of this fantastic event, including Komen OC, which received a donation of $900 from 4 different pieces of work. 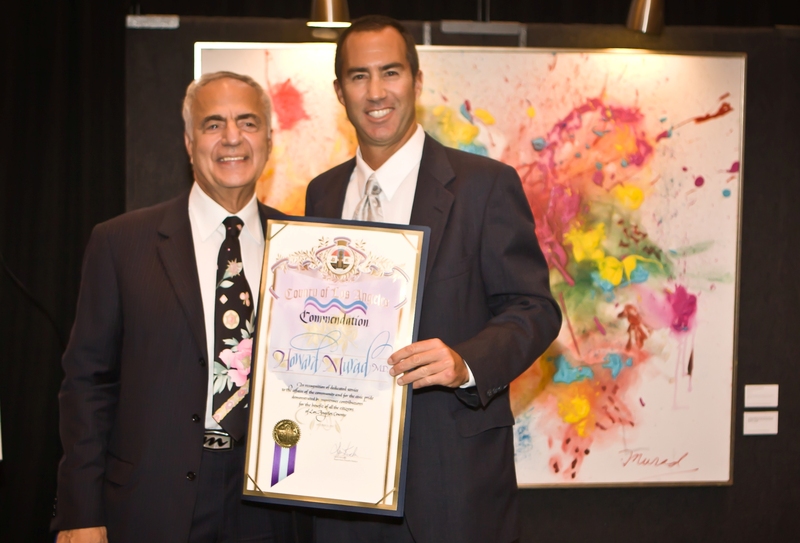 Steven A. Napolitano, Deputy, LA County Supervisor, presented a certificate of appreciation on behalf of the County of Los Angeles to Dr. Murad at the event, acknowledging his philanthropic contributions at The Art of Giving as well as his ongoing pro-bono medical work at local hospitals and children’s organizations.